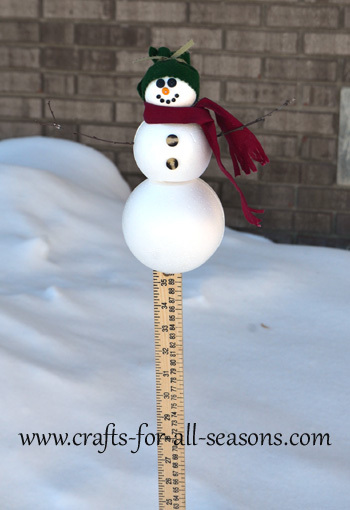 This snowman snow gauge is a cute tool to use to measure the amount of snowfall. Keep this yard stick by your door so you can measure the depth of the snow. 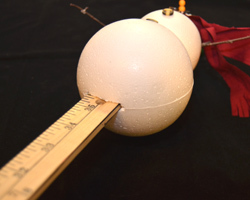 Just plunge the stick into the snow in your yard and you can get a quick measurement. We live in a part of town that is elevated, so we often get more snowfall than our neighboring cities. It is fun to have a quick way to measure how much snow has fallen the night before. I also have family that lives in North Carolina, and when they call they always want to know how much snow we've gotten. Now I have a way to tell them exactly! 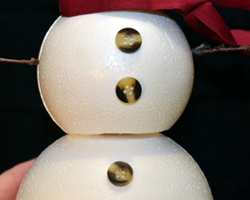 The snowman on top of the yard stick is made out of three foam balls. Add a few embellishments, and you're done! 1. 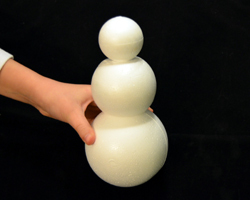 Begin this snowman snow gauge by slicing off a small portion of the 2 inch and 4 inch foam balls, as shown. 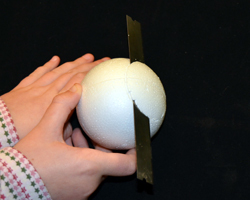 For the 3 inch foam ball, slice off a portion of the top and bottom of this ball. This is done so the balls sit flush with each other when you stack them to make a snowman. 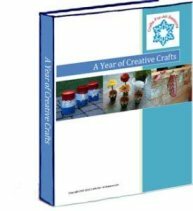 I used a long craft blade which is used to cut polymer clay canes (you can find them in the craft store near polymer clay). If you do not have a blade like this, you can use a knife, but please be careful! 2. 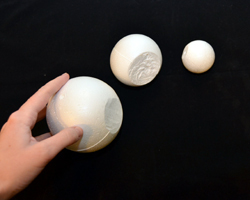 Next, push a wooden craft stick through the middle of the 3 inch ball, right through the flattened areas you just carved. 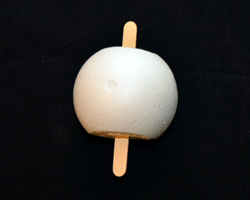 The stick should stick through both sides of the ball, as shown. 3. Push the large 4 inch ball on the bottom the stick, and the 2 inch ball on the top of the stick. The balls should now be sandwiched together, with the flat sides flush. 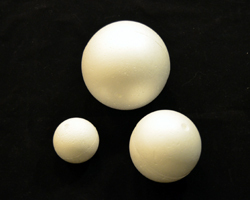 The three balls should now be looking like a snowman. 4. 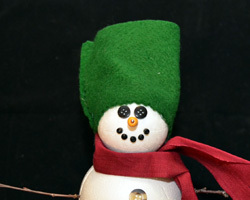 You can make your snowman look any way you want, using many different craft supplies you may have on hand. I will describe what I did to make mine. 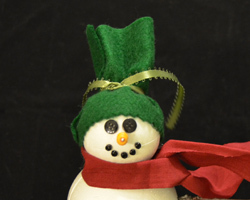 For the scarf, I cut a small length of red fabric and tied it around the snowman's neck. 5. Next, I glued small buttons to the body, and used buttons for the eyes. I glued large black seed beads to form a mouth. 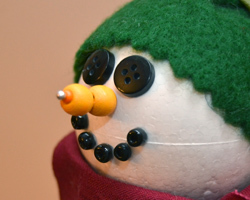 For the nose, I threaded two wooden orange beads (about the size of pony beads) and one small orange seed bead on to a straight pin, and pushed it into the face to become a carrot nose. 6. To create the hat, I cut a rectangle of felt. I made it long enough to wrap around the entire snowman's head. I used hot glue to keep this in place. Next, I used a piece of ribbon to tie off the top of the hat, then cut off the excess. For the snowman's arms, I found two twigs and pushed them into the foam. 7. Using some scissors or a knife (be careful!) 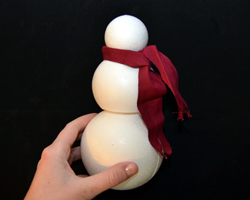 make a opening in the bottom of the foam so you can push the yard stick into the snowman. I was able to easily do this using some scissors. 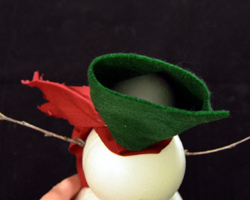 You can use some glue to secure the snowman on, if you like. 8. 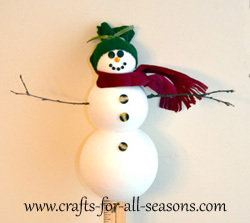 You can also use this snowman snow gauge as an indoor decoration too! Replace the yard stick with a small dowel to place in a plant, or use the snowman as part of a table centerpiece or displayed on a shelf.